Whenever I get a new device, I always want to protect it. When it comes to the MDA there are a number of things to protect. Specifically I am most worried about protecting the screen. Other phone products like the SDA Smartphone do not have the touch screen functionality so there is an additional layer of protection over the screen. I also worry about the device getting banged around in my pocket and getting damaged. Of course the worst thing to consider would be dropping it. With BoxWaves ArmorCase for the MDA, I can worry less about protecting the device and more about how I am going to use it to its full potential. I have always been drawn toward aluminum cases, simply because I feel they add strong protection from the device structurally and do not add a lot of bulk to the device. 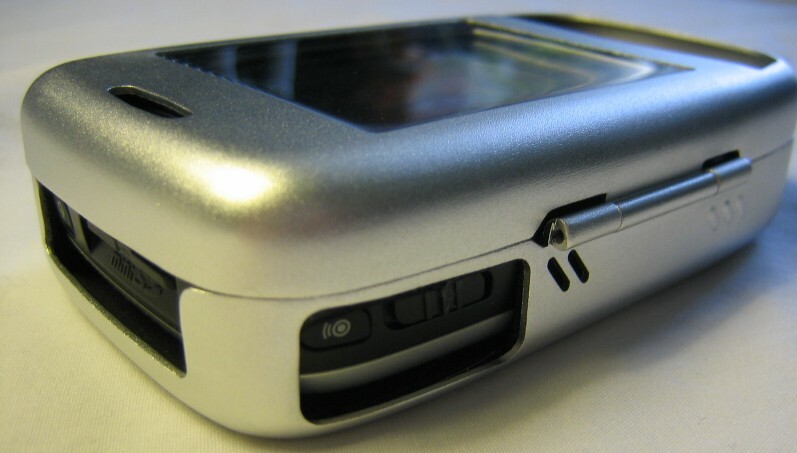 Prior to looking at this case with the MDA, I have used a number of aluminum cases on other PDA devices. For those devices, flip covers were were used to expose the screen but when the device was not in use, nearly all the device was covered. When it comes to a device like the MDA, while that could still be done, it would require users to open the case to read the screen when a call was coming in and to use the controls to deny the call. The ArmorCase has changed and now includes a clear plastic cutout in the front of the case so you can see the screen while the case is closed. 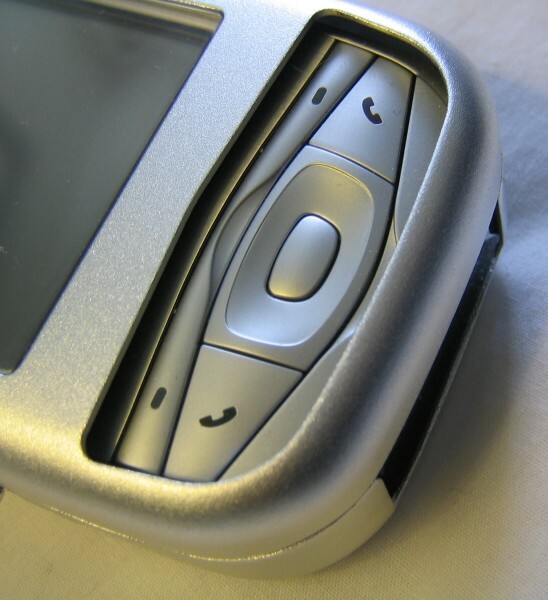 The MDA?s ArmorCase also includes an opening to access the front buttons. This means a number of interesting things. When the MDA is in the case, it, in essence, is like a Smartphone without a numeric pad. It is possible to place calls through the call lists and contacts lists using just the buttons on the front face and without using the screen. The plastic cover does not obscure the image and, while you cannot tap through it, acts like a screen protector, protecting your device from oils from when you use the MDA as a phone and of course protecting from damage by objects getting pressed against the screen. I have found this to be very beneficial, though sometimes I do find myself trying to tap on the screen through the cover because I forget it is on. 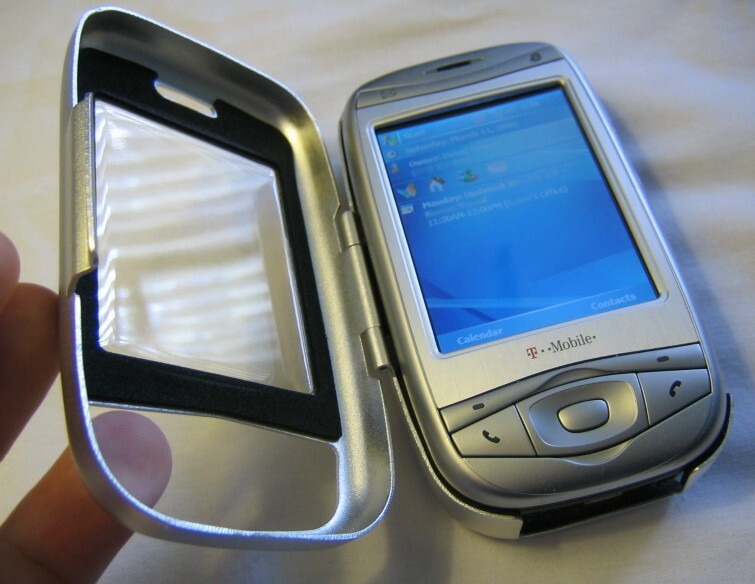 The aluminum case adds a skin around most of the device for protection. While I still don't recommend being careless with your device, I have dropped another device before in an aluminum case and it was been protected. Though it is important to note there is not a cushion for the device like a leather case might have. I figure the aluminum case could be better protection for people that like to carry their device in their pockets or worry about scratching and minor dings. 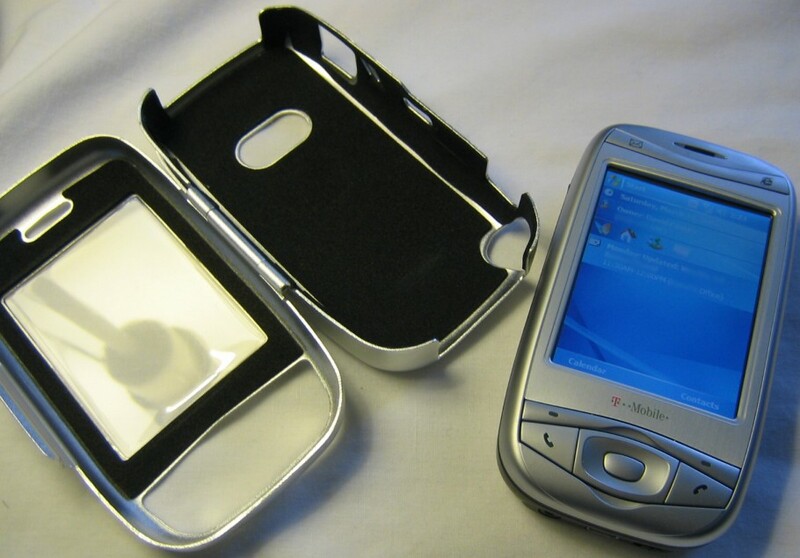 The case snaps close tight so that it will not open unexpectedly. As I stated earlier, the front buttons are exposed through the case. There is not any covering but is simply a rectangular hole to reach the directional pad and the five other buttons. There is a slight gap between the top of the MDA and the inside of the case. This leaves a significant amount of room between the lip of the case and the buttons, making them slightly more difficult to press. For the action, send and end buttons as well as the left and right arrows, it is not a big problem to pressing the buttons. The soft keys are a little smaller and closer to the case and can be difficult to press, at least until you get used to their location. The same goes for the up and down buttons on the directional pad. 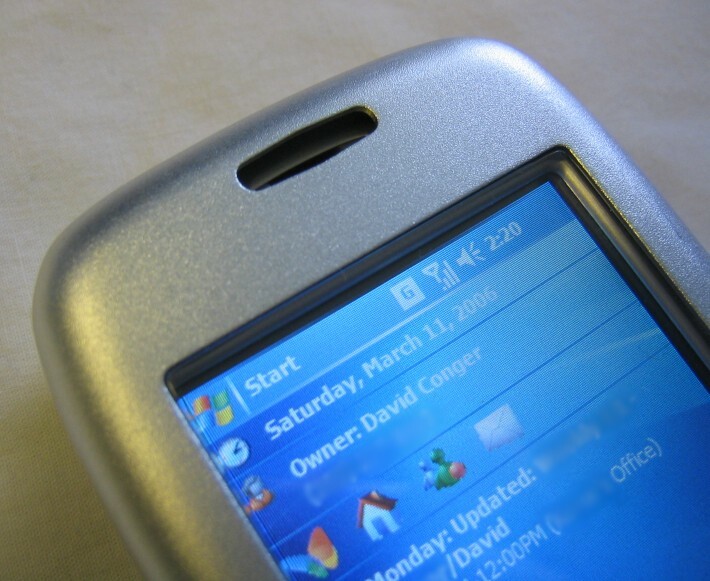 On the left side of the case (on the same side as the hinge) is an opening for accessing the connection manager button and the up/down slider. The device sits kind of high in the case so instead of the up/down slider being in the middle of the opening, it is near the top. This makes it not as easy to use as if it were actually in the middle of the opening. On the top of the device the power button is centered between the opening. It is easy to reach as is the miniSD card slot. Both buttons on the right side of the device are exposed. The infrared port is not exposed except when the case is open because the case overlaps over it to stay closed. The reset button is not exposed at all, even if the case is open so you must take the device out of the case to press it. The stylus is accessible from the bottom of the device (though obviously you can?t use it with the case closed). The headset and USB ports are both exposed. The battery latch is also exposed though it has little use because the device is in the case. On the back of the device both the camera and the light are exposed and can be used with the case on. Inside the case is a small black lining to keep the device tight in the case. While I normally keep my device in my pocket, the ArmorCase also includes a belt clip. There is a peg that comes with the case that can be screwed into the back of the case. It adds some size to the device and I do not know that I would want it on there when I was not using the belt clip, but it can be easily removed just by unscrewing it. A clip is used to hold the case to your belt, and the clip is pretty standard compared to other cases with a similar belt clip style. One of the most unique features of the MDA could easily be thwarted by a case. The slide out keyboard is something I was not quite expecting to still work inside an aluminum case, but it in fact does. 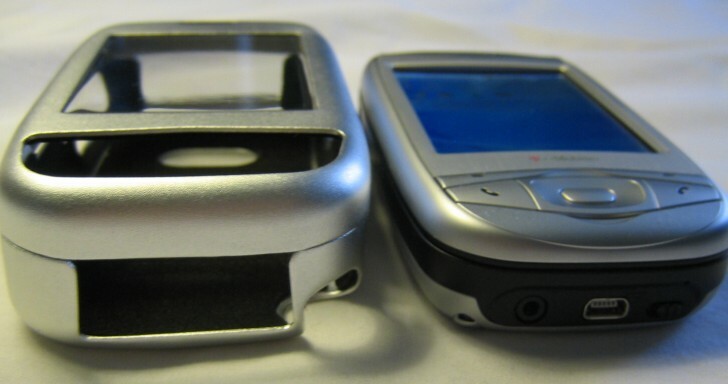 The ArmorCase was made in just a way so the bottom half of the case does not reach over the split in the device. The keyboard slides away from the top half of the case so the cover may impede on how you hold the device. I found that it is not that big a deal though it is a little awkward trying to type if you are walking are something because the top of the case kind of bounces around. With the keyboard is open, the other difference in feeling is the open lid of the case. When protection of your device is key along with the size, an aluminum case is one of the best options. The ArmorCase fits tight around the device, protecting it while in the pocket, but still allowing minimal functionality with the case closed. With the ArmorCase for the MDA, nearly all ports are exposed and the case is styled in a way so that when open, the keyboard functionality is fully available as it would be without the case. 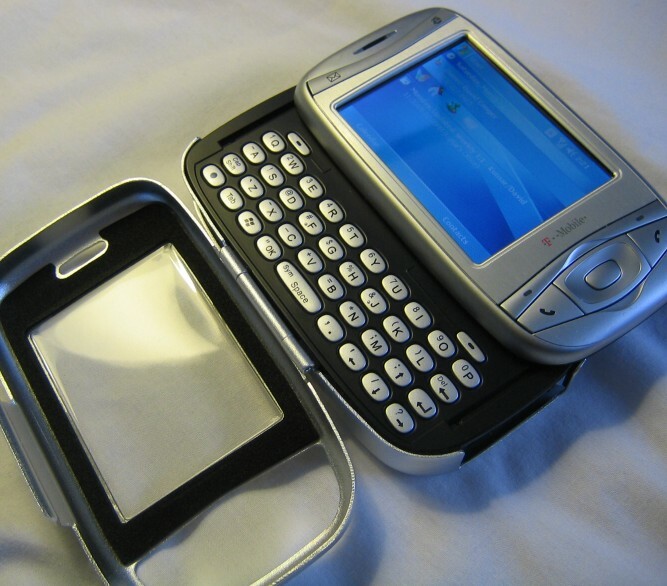 The ArmorCase is available from Boxwave for $28 ($35 regularly priced, but at the time of the writing it was on a web special). The ArmorCase has a low profile making it go easily in a pocket, while still protecting it from bumps while you are on the go.